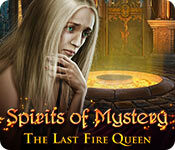 Spirits of Mystery: The Last Fire Queen is rated 2.5 out of 5 by 6. Rated 4 out of 5 by skullfun from ~~THERE MAY BE HOPE FOR THIS SERIES WITH THIS EDITION!~~ This adventure begins in the peaceful realm of the Fire Kingdom ruled by King Wirth and Queen Gloria for a long time until a tragedy struck and Queen Gloria died right after she gave birth to the twins. One of the twins was born with a curse mark near her heart and was sent by the King to imprisonment in fear of bad fortune. The other half of the twins, Princess Fara, was sent to a monastery with her nanny. Now that Princess Fara has finally woken up and the Great Flame that fuels the kingdom is nearly out, she's desperate to find her long-lost twin sister, while also saving King Wirth from his descendant to insanity, and save her kingdom... Spirits of Mystery: The Last Fire Queen starts off with a fascinating storyline that is unusually complex for this long-standing HOPA series. Unfortunately, the illogical story detracts from the overall gameplay of this edition in the series. Moreover, none of the characters in The Last Fire Queen develops enough backstory to establishes any connection with fans who play this edition. The plot feels too complex to retain your interest in the game after about 20 minutes in. On the gameplay side, Spirits of Mystery: The Last Fire Queen does not impress me like previous editions. 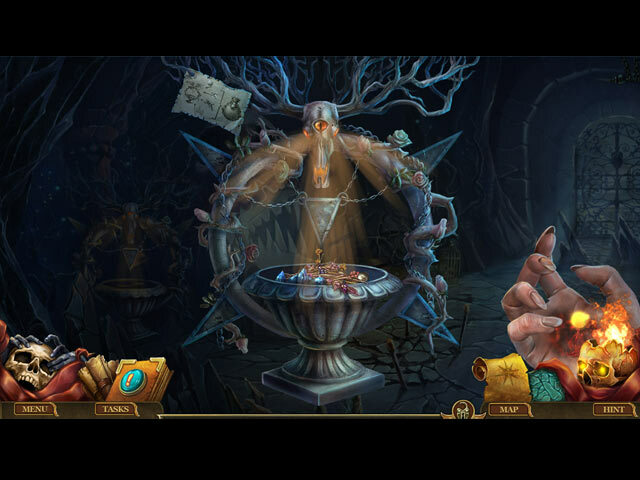 The adventure aspect of the game is pretty much by-the-book, the hidden object scenes are basic and bland, and the puzzles are ones that we have all seen countless times before. I did appreciate the difficulty selection for the puzzles, although the “Hard” mode usually only increases the tediousness of the puzzles. One redeeming quality in this lackluster game is the graphics. 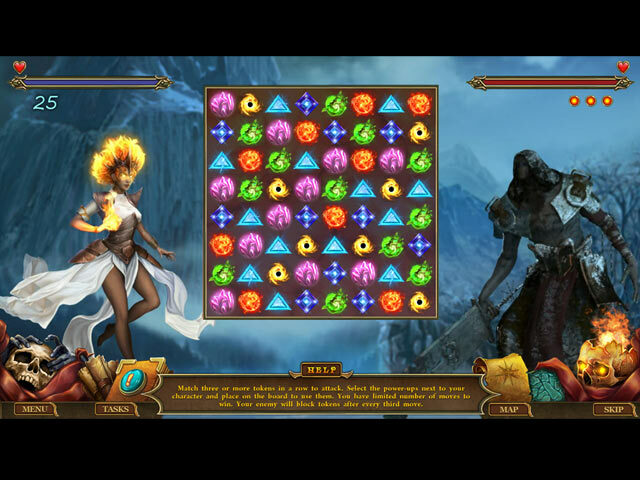 Spirits of Mystery: The Last Fire Queen showcases some of AMAX Interactive’s best visuals. The fuzzy quality that usually presents in this developer’s previous works was replaced by much sharper, higher-quality graphics. The animations, along with the special effects are also extremely well-done and always give the player something eye-catching to look at. 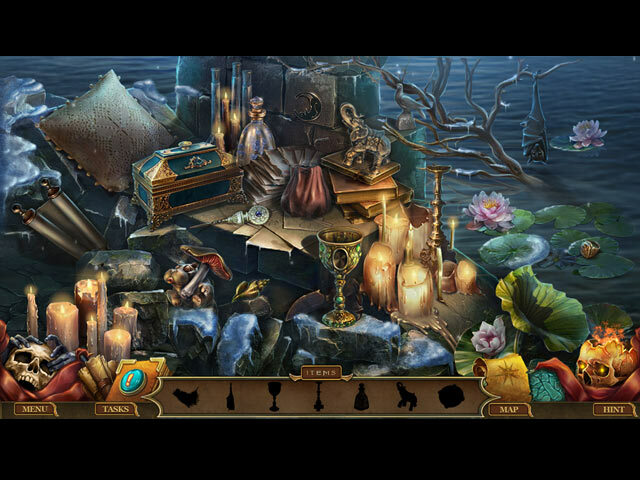 Spirits of Mystery: The Last Fire Queen took me four hours to complete the main game which I enjoyed. Usually Amax Interactive games offer roughly two hours of game play to finish the main game, even for beginners. When ERS Game Studios changed their name to Amax Interactive in 2017 I noticed a big difference in game development and not to the development teams advantage. I miss the SHOCK VALUE (which never offended me) and bizzare themes that made this game company very unique! I hope the next edition will be more like the earlier versions of this series when the developers were ERS. Cheers! Rated 4 out of 5 by biscuitsmama from NOT 5-STARS BUT CLOSE When I tried the beta for this game I found it so gruesome and disturbing that I gave it a very negative review and said I wouldn’t buy the game. When the game was released this morning I don’t know why I tried it but I did and I am very happy to see that perhaps, along with me, others complained about extremely dark nature of the game as well because there were quite a few changes made after the beta. I actually ended up buying the game this morning and find that I am enjoying it. King Wirth and Queen Gloria ruled the Fire Kingdom wisely until tragedy struck and Queen Gloria died in childbirth. Not only did the queen die but one of the babies was born with the mark of a curse near her heart. The king made a difficult and separated the twins at birth sending one to a monastery with her nanny and the other, the cursed child, he had imprisoned under the ice in a lake. Thus begins the tale that will take Princess Fara on her journey to find and help her twin and to save her kingdom as well. The graphics are excellent and beautiful as they always are with this team but it seems we now have a new nanny. Gone is our bit rotund and wise nanny who has been with all of the princesses since the series began. Our new nanny is now a rather trim version who has her head swathed in a turban-like bandage. I guess the developer felt the new version fit into the style of the game better than the original nanny. One of the HOP scenes early in the game stayed the same in spite of my notes to BFG that the items were almost invisible. I think that there should have been an alternate game available or perhaps a skip button after a certain amount of time. That particular scene was grueling and it took random clicking around the entire scene to find the items. There has been a trend with certain developers towards making very difficult HOP scenes and I think that developers should remember that most HOPA gamers are older and don’t have eyes that are generally as sharp as those of the younger gamers. The puzzles are good and I found myself enjoying them a lot with the exception of the repeat the sequence puzzle. I generally enjoy most of the puzzles that this developer includes in their games and find that they always throw a few tougher ones into the mix to keep me on my toes. With each new release of a game in the Spirits of Mystery series we see the games becoming darker and much less to my liking or taste. Although I love the developer and its capabilities, when the company changed from a family owned development team to a presumably corporate one, the games became darker in storyline. It doesn’t matter which series – Puppet Show, Dark Tales, Grim Façade, Redemption Cemetery or Spirits of Mystery, they all seem to be taking that slippery slope into titillating those who clamor for this type of dark and disturbing game while offending and ultimately losing their longtime fan base. As I mentioned above, I was pleased to see that the developer listened to some of the complaints and eliminated what I found quite objectionable from the final release. Now I am enjoying the game play and the storyline far more than I would have thought possible. Thank you AMAX and BFG for presenting a game that I can now play and enjoy. Happy gaming! Rated 2 out of 5 by Granny_Gruff from Sometimes the Second Time Around is Better, or NOT I always think that I may like a SE version better than the CE, just for the break on the price as the extra chapter in CEs are shorter and add nothing to the overall story. This time I was disappointed, which is not unusual. The biggest sorrow in this game is the story line, which is just odd, The King and Queen have twin daughters, one of whom is born with a curse mark on her body. So oneis imprisoned in an ice lake and banish. The other is sent to a monastery with a nanny. Theoretically both girls sleep through the first 25 years of their lives. Fara, in the monastery, awakens from a bad dream at the end of her 25 years nap and Nanny sends her to find keys and seals and other gratuitous objects to get out of the locked monastery and rescue her sister who, Nanny guesses, is in peril. Good stuff: Maybe this is the last game in the series. Bad stuff: Everything else! The story makes no sense. The puzzles and HOPs are very familiar. Almost everything is locked and sealed. If it is not locked and sealed, it is frozen or missing. The new Nanny character has bandages that encompass a weird headdress and her eyes, leaving the impression that she is blind. This is not the slow meandering Nanny we've come to dislike in the series. This is a whole new one to frown upon. You play as Fara, the princess left to sleep away her first 25 years in the monastery. You are awakened by a nightmare of your sister, Sybil, in peril. You hope off your couch already to do battle to rescue her. Presumably you have no need of food, clothing, or facts. The first few games in this series were better than the ones we've been seeing lately. Unfortunately this new entry is a giant leap downwards. Please play the demo to see if you see something I missed out on while slogging through the demo. Rated 1 out of 5 by nonameplayer from Very Disappointed The game started off without any problems but as soon as it tried to change locations it locked up and stopped. I rebooted and reopened the game and continued playing for a while. The same thing happened a couple more times but I kept trying. Now it has given me a runtime error and shuts down as soon as I try to use the cursor. I'm running Windows 7 and haven't had this problem with any other game. This is extremely annoying not to mention waste of time and money.